I love watching people's end of year videos on Facebook. My name is Alex, and I am a Facebook stalker. I'm really not that active on my personal Facebook page, so if I made one of those cutesy little timeline videos, it would probably be blank. I am more active on Instagram though (go follow me there! ), so I took it upon myself to pick some of my year's highlights to show to you. These are in somewhat of a chronological order, and I will explain a few of them to you, mostly for my enjoyment. We went to Hawaii in January!! Dave's cousin got married in the most beautiful wedding ever. I wish I was there right now. Seriously. I sold my car on Craigslist, and then leased a brand new Toyota Corolla. Still in love with it and the bluetooth and back up camera. My Toms started falling apart, so I decided to paint a design on them to make them last a little longer. This is one of my favorite up-cycle projects I've ever done. Dave put a ring on it!! We both turned 52 25 this year and ate cake! I had a new venture at work, which allowed me to write and run supertitles for the shows! Exciting and scary and fun! Also made a couple of delicious things, which I shared with you. I'm going to keep making delicious things and try to figure out a better way to share recipes! Have a wonderful and safe New Year's Celebration tonight! Congratulations! Such a great 2014. Here's hoping 2015 is even better! Cheers! What a fun 2014! I hope your 2015 is even more fun and exciting. Thanks TaMara! I wish you the best in 2015! Thank you Kelly!! Wishing you the best!! What an awesome year!!! Here's to 2015 being just as good or even better!! I will be sure to follow you on Instagram. As a travel writer, I'm on there, too. But, I have a more fun "me" account at leighphines. FYI, the IG link on your sidebar is not working, but I was able to get to your account via your post link. Thanks. 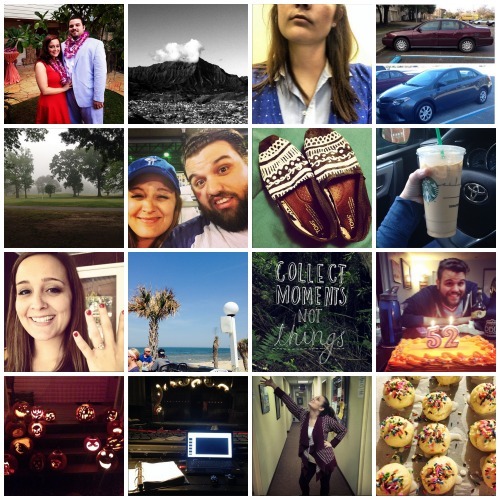 Awe, it looks like you had some really wonderful moments in 2014. Happy New Year! What a great year! Congrats on the ring and I will be looking forward to seeing more! Congratulations! Looks like a great year! Wow! You had an amazing year! Congrats. I love your Toms by the way! So creative. I'm so going to try that. Have a Happy New Year!!! Looks like an amazing year. Hope 2015 will be just as amazing. Ah thank you!!! I just changed my handle, so that must be why! Thank you! I hope you had a nice celebration, and have a nice new year as well! Thank you Amy! Enjoy your new year! Thanks! Let me know if you try them, I'd love to see them! Thanks! Have a happy new year! Thank you! I hope so for you as well.